Vedic Line Moisturiser for Normal to Dry and Mature Skin. Few days back I got a Vedic Line Moisturizer as a gift by one of my friends. Its Vedic Line Sandalwood & Turmeric Moisturizer specially meant for normal, dry and mature skin types. I am quite a regular buyer of Vedic Line Products. I have used lot of them and even reviewed many of them. My favorite among them is Vedic Line Papaya & Hibiscus Moisturizer which I simply love. I with oily skin would not have personally bought this moisturiser since its specially for dry mature skin but when I got this Sandalwood & Turmeric moisturizer, I was very happy to receive this just because of it amazing packaging, which is quite similar to Vedic Line Sandalwood and Turmeric Face Wash.
What Vedic Line Sandalwood & Turmeric Moisturizer Claims? Sandalwood - Has a warm & spicy aroma. Heals and tones up skin. Turmeric - Is antiseptic. Helps to give slow to skin. USAGE - Lightly apply on damp/moist skin. It will help to seal in moisture. Price - Rs 220/- for 200 ml. 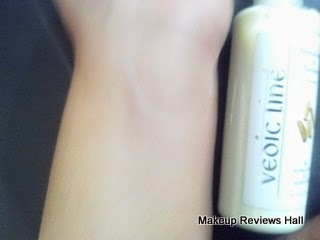 Even before using this Vedic Line Moisturizer, I started loving it mainly because of its good and friendly packaging. I have very rarely seen moisturizers with a pump dispenser except the Lotus Herbals Hand & Body Lotion. Normally they come in flip or tube form, like its face wash for sensitive skin also comes in a tube form but I love pump one because they are so quick and easy to use. The moisturiser is light yellow in color. It appears almost similar to a butter in a melted form. 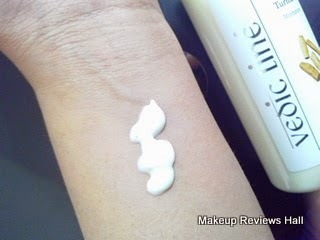 The consistency of this is slightly on the thicker side, since it’s specially meant for dry and mature skin beauties. Other than this, I have seen many its products which are beneficial for dry skin one of them being Vedic Line BB Cream. Though it appears to be little thick but its not at all heavy when rubbed. It glides very smoothly on skin making it look nourished specially when its dry skin. Take a look at the picture below after application of this moisturizer. It instantly made my hands super soft and smooth along with covering those fine lines which you could see in the previous picture. The smell of this is completely ayurvedic. I can truly feel as if I have lighten some incense or so and frankly I actually don't like such smell. I like something like cool light refreshing fragrance, which is not the case here. It has strong ayurvedic fragrance, which lingers for long. Now coming to its effectiveness on my skin. I have oily skin on face and rest of my skin is normal to dry. When I used this moisturizer on my face, it gave me oily and heavy feeling which I didn't like. Though it’s not even meant for oily skin but I was just using it out of curiosity. However this nourishing lotion worked wonderfully on my normal to dry hands, arms and feet. It nourished and moisturized them instantly and maintained it soft and smooth for long. 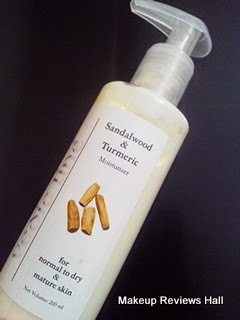 Overall this Vedic Line Sandalwood & Turmeric moisturizer does what it says. It works beautifully on dry and mature skin by giving it immediate nourishment , also helps in hiding dry skin and few fine lines. For oily skin, it’s a complete no, but people with normal skin can definitely use this Vedic Line moisturizer. Thick texture suitable for dry and mature skin. Help in reducing dryness and fine line instantly. Turns face oily if used in summers.